ნენე მარიანა კარლსონი (შვედ. Neneh Mariann Karlsson; უფრო მეტად ცნობილი, როგორც ნენე ჩერი დ. 10 მარტი, 1964) — შვედი მომღერალი, პოეტი, სიმღერების ავტორი, რეპერი და DJ. ორჯერ იყო ნომინირებული გრემის და MTV ევროპის მუსიკალურ პრემიაზე. ნენეს ნახევარძმა არის Eagle-Eye Cherry. ↑ Strong, Martin C. (2000). The Great Rock Discography. Mojo Books, გვ. 176. ISBN 1-84195-017-3. 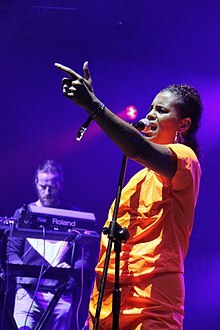 ↑ “Q&A: Neneh Cherry“, The Guardian, 14 June 2014. წაკითხვის თარიღი: 10 January 2015.
ეს გვერდი ბოლოს დარედაქტირდა: 08:32, 2 აგვისტო 2018.